What is it with animals that kids love? 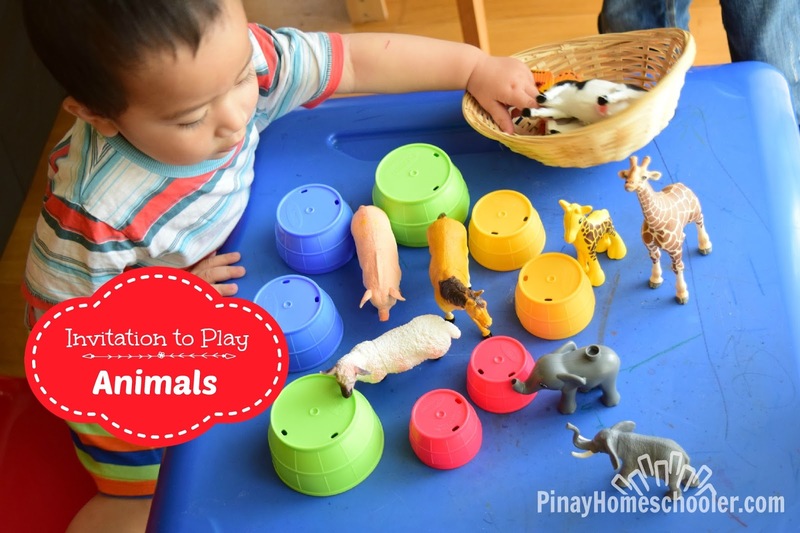 My husband asked me this question when he saw my pile of Safari Toob animal figures years ago and asked me why I incorporate animals in our homeschool activities. I have no scientific answer to his question but all I know was that Mavi was enchanted with animals (until now!). The way I see it, it's because of the unique sounds they make and how different they look from their parents and siblings LOL. As a young boy, Mavi loved singing the Old McDonald song because he enjoys making the animal sounds. He can get hooked for hours to any animal-related activities and play. Of course, a visit to the zoo completes all these lessons and activities. We've been to four zoos for the 6 years, all of which are in different countries. As of this writing, Mavi is obsessed with dinosaurs even if he haven't seen one. Now comes Vito. He also loves animals. The first animal sound that he ever made was that of the dinosaur's (thanks to his big brother!). Aside from dog, cow, bird and cat, Vito identifies other animals through their sound. Now with this sudden interest, I am joining the bandwagon of "invitation to play". If you haven't heard about it yet, here's an amazing tutorial from Teach Preschool. 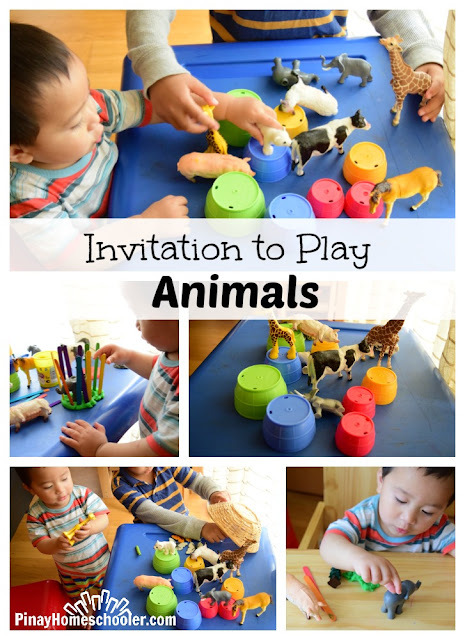 So this is my first attempt of setting up an invitation to play of animals for Vito. Oh boy! He was so happy, kept on jumping and clapping his hand showing his excitement! 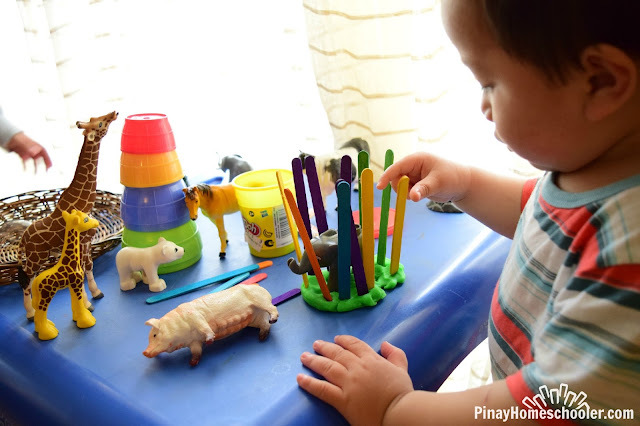 As we play, I keep telling him the names of the animals and their sounds. This is what he likes best. See the picture on the left? He's asking "what's this?" and that's a cue for me to answer and make the sounds LOL. But guess who enjoyed it the most??? The big brother! I wish I could get rid of all the furnitures in the sitting room and replace it with a huge play table for these boys lol. He specifically loves this popsicle stick cage Mavi created for him. Vito still mouths objects so I'm not letting him use our Safari Toob animal figures. What we are using here are Schleich animals and Duplos. The stacking cups you see there are Playskool Barrels which are my son's favourite toy. Now this was an awesome and unplanned activity, and it turned out enjoyable for the boys! Why not start doing your invitation to play? You don't need to buy new toys. Just make use of what you already have, set it up in table accessible for the kids, add some craft sticks.. papers, baskets and playdough and you're all set! Now be sure to pin this for later! We do a lot of fun and educational activities at home. 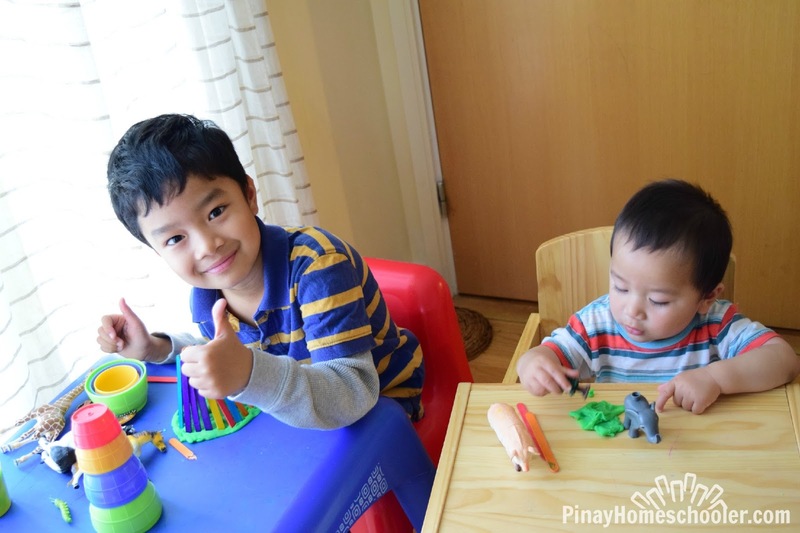 To keep up with the updates, visit in the blog The Pinay Homeschooler, or in Facebook, Instagram and Pinterest.